(Reuters) - The trade battles being pursued by U.S. President Donald Trump’s administration are likely to lead to fairer but still free global trade, said Mohamed El-Erian, chief economic advisor at the Allianz Group, Europe's largest insurer. 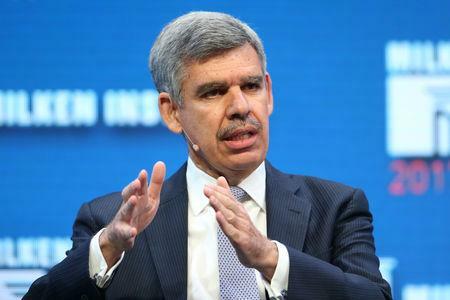 However, there was still a 1-in-4 chance of a full blown global trade war that could lead to a hard landing in China and a global recession, El-Erian told the Reuters Global Markets Forum in an exclusive interview on Wednesday. There is significant scope for more volatility in emerging markets due to potential forced selling on the back of stop-losses, El-Erian said. Contagion risks, though limited for now, could increase "if bad technicals become bad economics and finance," with the least liquid markets being in the greatest danger, he added. Q: How much worse can it get for emerging markets (EM) - the Indonesian rupiah/Indian rupee/Mexican peso - and those economies and how much more can central banks spend from their reserves? A: While markets have been calmer recently, or at least less turbulent, there is still significant scope for further volatility. And this is because some key market technical are still off-sides. The longer this persists, the greater the risk that bad technicals contaminate the economics. Currency and interest rate moves become the transmission mechanism, amplifying the challenges rather than acting as shock absorbers. Q: Would you please elaborate on what you mean by "key market technicals are still off-sides"? A: Key market technicals are still off-sides refers to some investors still needing to reduce their exposures. It means the likelihood of forced sales that are not necessarily related to the underlying fundamentals. Q: Do you detect signs yet of contagion into non-EM funds from EM, particularly the less liquid EM corporate bond funds? A: While there has been some contagion, there is more evidence of investor differentiation up to now. This would likely change if bad technicals become bad economics and finance. Q: Which markets do you see most at risk of contagion? A: The less liquid ones that also are structurally fragile. Various segments of EM -- starting with local currency exposures such as local bonds and stocks -- are at the forefront. The base of dedicated investors, including domestics, is too easily overwhelmed by the volume of the more flighty cross-over funds. The results are repeated overshoots, both on the way up and on the way down. For the more fundamentally robust countries, many of which are in Asia, this provides interesting opportunities for those investors able and willing to underwrite significant volatility. Q: What's the risk of financial market turbulence in China (falling yuan, stocks selling off) affecting the real economy in China? A: The risk is there and requires careful management by the Chinese authorities. Compared to other countries, China has more effective tools to stop the general contamination of the economy from financial variables. Q: What do you see as the endgame to "trade wars"? A: In thinking of the prospects of the trade war, it is important to distinguish the journey from the destination. The journey will remain very noisy and unsettling. But I suspect the destination will be less so. As the U.S. secures concessions, which ultimately it will, because of the underlying game theoretics, I put the probabilities for the distribution of outcomes as follows currently: 60 percent of slightly fairer but and still free trade; 25 percent of a global trade war; and 15 percent of a "Reagan Moment" that significantly improves the landscape for international trade. Q: Do you see China taking the extreme step of dumping U.S. bonds and taking a harder stance on its currency to arm-twist on trade issues? A: No, I do not see such a step by China as likely. And neither do the markets. Q: Can the trade war turn China into a risk for the global economy? What's the risk of a hard landing there? A: Yes, it can -- thus the 25 percent probability of a global trade war that would cause a global recession, increase financial instability and complicate both politics and geo-politics. It is "left tail" rather than a baseline. Q: Are your surprised by the tenacity shown by the U.S. equity markets with respect to trade wars? A: Not really surprised as U.S. stocks are benefiting from a notable (policy-induced) pick up in domestic growth and corporate profitability. I expect the U.S. to continue to outperform other advanced economies. And look for this issue of divergence -- not only in economic performance but also policies -- to have a larger impact on markets going forward. Q: How long would you say this U.S. business cycle has to run? A: The real question is to what extent will the cycle develop secular and structural legs. This is happening gradually in the U.S., Europe and Japan are unfortunately lagging. Q: What is your view on the U.S. dollar? A: Likely to appreciate further due to the prospects for both growth and interest rate differentials that markedly favour the U.S. relative to other advanced countries. Q: What is your expectation on the Fed rate hike path? How many hikes do you expect in 2018 and 2019? A: My baseline currently is for four more hikes until the end of 2019, with the balance of risk favouring five. Q: Do you see Trump's hard line on trade abating post the midterms? A: Only if he secures concessions from trading partners. Look at the U.S.-Mexico negotiations for insights. Q: By when do you see the ECB beginning tapering? How would that impact liquidity flows? A: The ECB has started tapering and will continue to do so. This will tend to tighten global financial conditions as, on the other side of the Atlantic Ocean, the U.S. will raise rates further and let its balance sheet gradually shrink. Indeed, one of the major questions facing the global economy is what happens when not one, but three systemically important central banks are tightening. We know that the Fed can, adapting (billionaire founder of investment firm Bridgewater Associates) Ray Dalio's phrase used in another context, deliver a "beautiful normalisation." The jury is still out as to whether three central banks can do so simultaneously. Higher and more balanced global growth would sure help in this regard. Q: A quick word on Brexit, and especially in the scenario of No-deal Brexit with big players like German banks and carmaker Jaguar Land Rover talking about catastrophe? A: A no-deal Brexit would pose an additional set of short-term challenges for the UK (primarily) and the rest of Europe. Many institutions that are planning until now on a "soft" Brexit would have to adjust. Timing is also important as the longer the negotiations are stretched out, the more this diverts attention from what's needed in both the UK and the rest of Europe to enhance productivity and growth.